The expectation was high as we headed upwards to the land of manufactured snow and it did not disappoint. Scouts, leaders, and family members hit the snow slides this afternoon with much enthusiasm. All aboard for the journey upward. After a 2.1 mile journey up the mountain on the aerial tramway to Ober Gatlinburg, we were issued our tubes and headed to the top of the slides on the conveyor belt - aka the magic carpet. 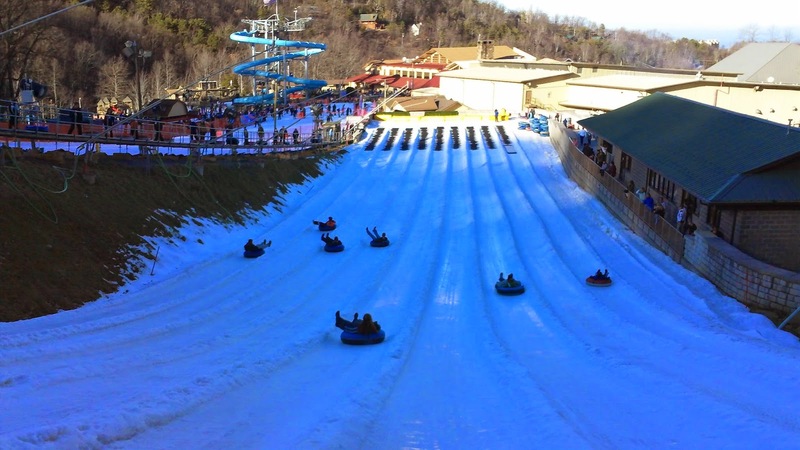 The weather was beautiful and the snow was cold as we made numerous trips down the slides at breakneck speeds. For some, the speed was not diminished at all by the rubber pads at the bottom of the slides and the ride ended with a resounding thump into the padded barriers beyond the end point of the slides. However, that just made the run more exciting. Heading down the slides at top speed. 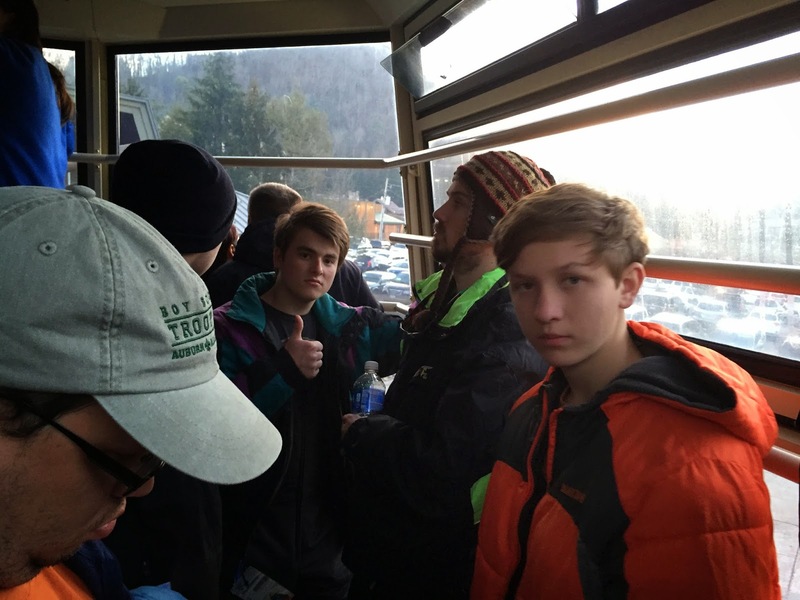 After an hour and a half of tubing, we loaded aboard the tram and headed back to town. After another walk around the main drag, we settled in for a nice dinner at Blaine's. We received excellent service from both the management (who were able to get us a table for 18 in a reasonable time) and the waitress, who carefully looked after our every need. An intimate setting for eighteen hungry Scouts. After returning to the motel, we held a short meeting to update everyone about our activities on the morrow. 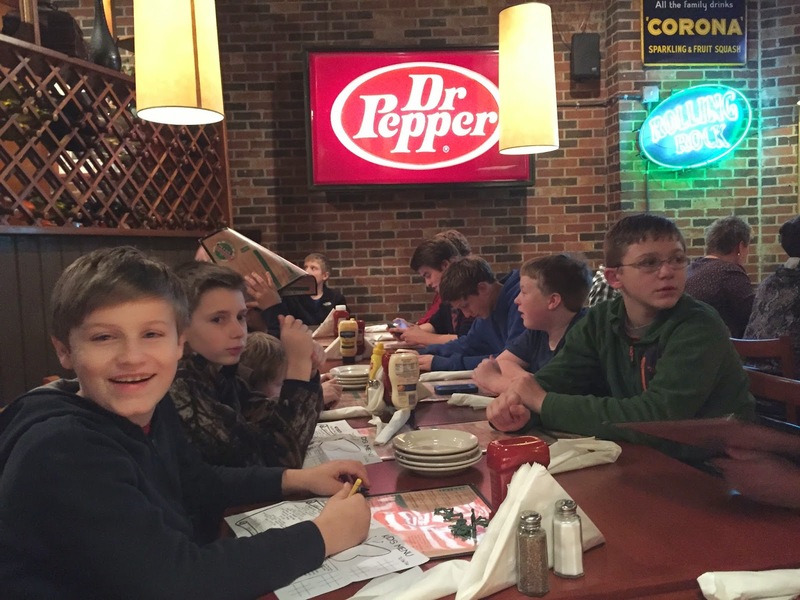 Several Scouts had numerous questions about everything from ski school and the different types of slopes to the food we would eat. Following the meeting, the new assistant patrol leader of the Carnivorous Panda Patrol received a birthday surprise. Scouts sang Happy Birthday to Everett in celebration of his twelfth birthday and helped him eat some nice cupcakes, courtesy of his father and GiGi's Cupcakes. The boys are now in their rooms, no doubt dreaming of skis and snow. For more photos of the days events, check out the online photo gallery.